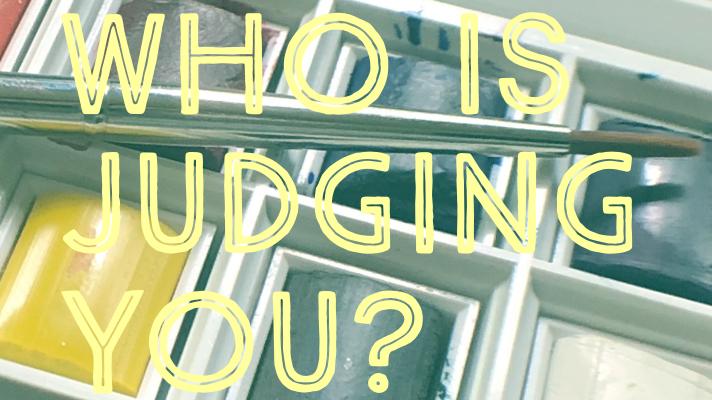 Who’s Judging You? – Love. Life. Practice. Monday night I was continuing my journey into learning visually by attending a life-drawing class at a nearby community center. I’ve mainly been using charcoals and pencils for that kind of sketching, but I have a nifty new portable watercolor set that I was planning on breaking out for the first time. So, with all the confidence of your typical middle-aged-white-guy who has put literally zero time into figuring out how something worked, when the model settled into the pose, I started working with the brushes and the little chiclet-like case that I had bought. It continued to not go well. And I stressed. As I struggled with the colors, with the liquid, with the brush strokes messing up my page, I felt my stress levels rising. And that’s when things calmed down, because I realized: I don’t have to put it on instagram. Sure, documenting my progress is fun, but I don’t have to show it to the world. Or the model, or Natasha, or my fellow artists. Even in private, I’m performing for a judge. As a public speaker and facilitator, I’m used to being “on”, putting on a friendly and professional facade as needed – that’s part of the job. And I have a “grandpa” mode, where I’m trying to be a constructive and bright part of my children’s and grandchildren’s lives. And while I’m getting better at it, it’s really rare that I can really let my guard down with my friends and loved ones – I mean, I’m honest about feelings and such all the time, but also always framed in a way that I hope makes me a positive part of their lives. I am still “on” when I’m alone. I work alone most of the time, so you’d think there’d be a difference. But no – every time I am working, playing, reading, I’m trying to do it in a way that supports my belief that I am the person I hope everyone thinks I am. It took a while to parse that sentence after I wrote it, and it kind of shocked me. Maybe it’s a product of writing blogs like this, maybe it’s part of social media culture, but really, no, I think I’ve been this way for as long as I can remember: everything I do, I do with the idea that someone, sometime, is going to judge it. Now, that’s not entirely a bad thing. It has motivated me to do a lot of positive and good things. But I can’t help but think that it’s not really healthy to have that all the time. I’m taking some time to try and pay attention to the part of myself that isn’t judged. That is private, and doesn’t worry about being relevant or not because no one – not even me – knew they were there in the first place. Nope, this is just something I observed in myself, and hey, thought I’d write about it. Might be an interesting experiment, though, to take a look at your own actions…and see what you do when you’re not worried about how anyone – not even yourself – might judge it.